Sergeant Jonathon Michael Hunter October 25, 1993 KIA August 2, 2017. 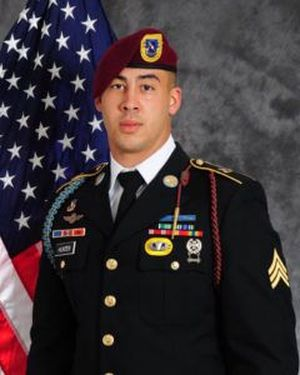 Sergeant Jonathon Michael Hunter was born October 25, 1993 to Mark Hunter, his father, and Kimberly Thompson, his mother, in Columbus, Indiana. He was raised in Columbus and attended Columbus East High School where he excelled on and off the football field. He made lifetime friends and was always known for his infectious smile and his passion to help others. He was always there to brighten the lives of others. After graduating, he pursued a career in music before studying one year at Indiana State University. In April 2014, Jonathon joined the US Army. Upon completion of basic training and airborne school he was assigned to Alpha Company, 2nd Battalion 504th Parachute Infantry Regiment in Fort Bragg, NC where he immediately distinguished himself as an outstanding paratrooper and leader. Jonathon married his loving wife on October 15, 2016. He was one of the few to earn the coveted Expert Infantryman’s Badge in late 2016 and graduated from the Army’s Basic Leader Course in April 2017 for his promotion to Sergeant in June of 2017. Sergeant Hunter proudly and willingly served his country and fellow Paratroopers in support of Operation Freedom’s Sentinel beginning in July of 2017. Sergeant Jonathon Hunter was KIA on August 2, 2017 in Kandahar, Afghanistan when a vehicle-borne IED attacked his convoy. His awards include the Parachutist’s badge, the Expert Infantryman’s Badge, the Combat Infantryman’s Badge, the Army Achievement Medal, the Army Commendation Medal, the Purple Heart, and the Bronze Star. Sergeant Jonathon Michael Hunter is survived by his wife, Whitney, his father, Mark, mother, Kimberly, and Stepfather Brian. He was a husband, child, brother, grandson, nephew, cousin, and great friend to many. Jonathon will always be remembered as more than a man in a uniform. In 23 short years, he made a lasting impact on so many individuals who will carry a piece of him until they are reunited again.